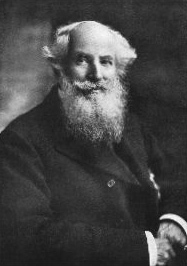 Furnivall thence became editor; he was enthusiastic and knowledgeable, but temperamentally ill-suited for the work. :110 Many volunteer readers eventually lost interest in the project, as Furnivall failed to keep them motivated. Furthermore, many of the slips were misplaced. 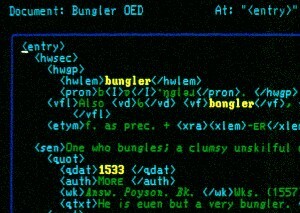 The production of the new edition exploits computer technology, particularly since the June 2005 inauguration of the "Perfect All-Singing All-Dancing Editorial and Notation Application", or "Pasadena". 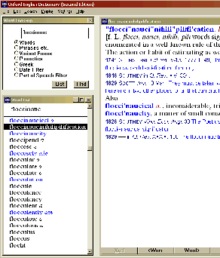 With this XML-based system, lexicographers can spend less effort on presentation issues such as the numbering of definitions. 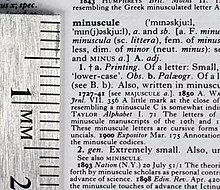 This system has also simplified the use of the quotations database, and enabled staff in New York to work directly on the dictionary in the same way as their Oxford-based counterparts. Wordhunt was a 2005 appeal to the general public for help in providing citations for 50 selected recent words, and produced antedatings for many. The results were reported in a BBC TV series, Balderdash and Piffle. 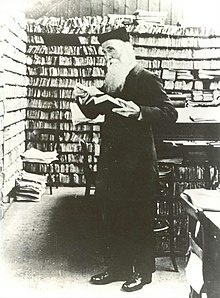 The OED's readers contribute quotations: the department currently receives about 200,000 a year. ^ Bernie. 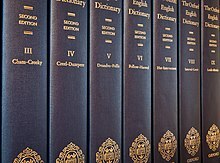 "Oxford English Dictionary News". Newsgroup: alt.english.usage. Usenet: [email protected]. Retrieved 7 June 2014.